Reached me on time and look forward to my next purchase. This monocular is unbelievably great!!! You got to buy one of these. This is a knock off of the more expensive German versions. I love the size and concept. It is super light and neat how it rotates. Unfortunately, I was not able to get a sharp image no matter how carefully I focused them.. On my pair (there may be a difference from one pair to another), the fuzzy magnified image did not show me any more detail that looking at the same object with the naked eye. I think that if you are going to go cheap (buy a low cost optic) then buy the most simple version, like a strait roof prism monocular. (which I also own and are even less expensive than this item and have much better image quality). This folding version is perhaps too complicated of a design for cheap optics. 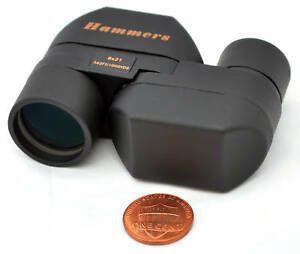 within the limits of miniature optics, it worked as expected - compactness is its major feature. If you need more light, laws of physics requires you to buy larger aperture. Magnification is maximum useable for a handheld optic - any higher power is pointless as the user could not hand hold it steady - and becomes impossible to find the target. So stick with 7x or 8x for practical use. This spy scope is no exception of Hammers quality, the optic are cheap but clear. I have Hammers scopes on more than a dozen or so air guns, and find them a well made China product. Air rifles are inherently hard on optics due to the "twang factor"" mostly on spring rifles.. The Hammers brand is what I stick now .